Marc Ribot’s Ceramic Dog and Skeletons play at (Le) Poisson Rouge as part of NY Guitar Fest. On Thursday (2/4) Chicha Libre and Gyan Riley close out the Fest when they soundtrack silent films at Merkin Concert Hall. Skeletons play with another multi-venue local fest that night, Sounds Like Brooklyn, at Zebulon with Up Died Sound. 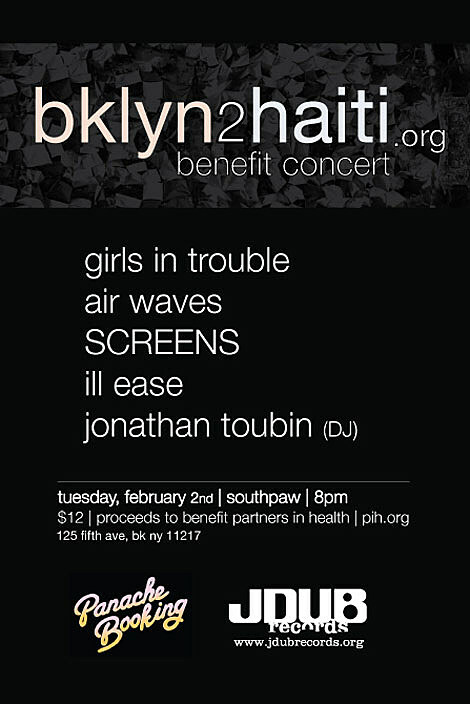 bklyn2haiti at Southpaw tonight “is a benefit concert raising funds for Partners in Health. This organization has been actively providing health care services to the Haitian community for over 20 years.” Bands are above. Flyer below.